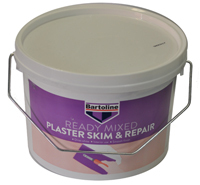 Plaster skim & repair is a simple to use product for repairs on plaster and plasterboard prior to decorating. It dries brilliant white with a super smooth finish. High adhesion properties make it ideal for use on vertical surfaces(even when wet) and for covering all gaps and holes up to 3mm deep. Available in handy 2.5 Litre tubs.